For several decades, Ethernet has proven itself as a relatively inexpensive, reasonably fast, and very popular LAN technology. This tutorial explains the basic functionality of Ethernet and how it can be utilized on home and business networks. Engineers Bob Metcalfe and D.R. Boggs developed Ethernet beginning in 1972. Industry standards based on their work were established in 1980 under the IEEE 802.3 set of specifications. Ethernet specifications define low-level data transmission protocols and the technical details manufacturers need to know to build Ethernet products like cards and cables. Traditional Ethernet supports data transfers at a rate of 10 megabits per second (Mbps). As the performance needs of networks increased over time, the industry created additional Ethernet specifications for Fast Ethernet and Gigabit Ethernet. Fast Ethernet extends traditional Ethernet performance up to 100 Mbps and Gigabit Ethernet up to 1000 Mbps speeds. Although products aren't yet available to the average consumer, 10 Gigabit Ethernet (10,000 Mbps) also exist and are used on some business networks and on Internet2. Ethernet cables likewise are manufactured to any of several standard specifications. The most popular Ethernet cable in current use, Category 5 or CAT5 cable, supports both traditional and Fast Ethernet. The Category 5e (CAT5e) and CAT6 cables support Gigabit Ethernet. To connect Ethernet cables to a computer (or other network devices), a person plugs a cable directly into the device's Ethernet port. Some devices without Ethernet supports can also support Ethernet connections via dongles such as USB-to-Ethernet adapters. 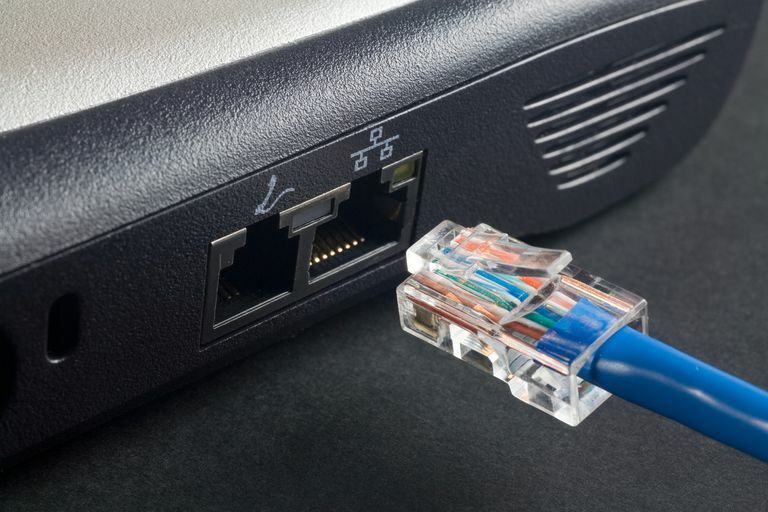 Ethernet cables utilize connectors that look much like the RJ-45 connector used with traditional telephones. For students: In the OSI model, Ethernet technology operates at the physical and data link layers — Layers One and Two respectively. Ethernet supports all popular network and higher-level protocols, principally TCP/IP. Often referred to as Thicknet, 10Base5 was the first incarnation of Ethernet technology. The industry used Thicknet in the 1980s until 10Base2 Thinnet appeared. Compared to Thicknet, Thinnet offered the advantage of thinner (5 millimeters vs 10 millimeters) and more flexible cabling, making it easier to wire office buildings for Ethernet. The most common form of traditional Ethernet, however, was 10Base-T. 10Base-T offers better electrical properties than Thicknet or Thinnet, because 10Base-T cables utilize unshielded twisted pair (UTP) wiring rather than coaxial. 10Base-T also proved more cost effective than alternatives like fiber optic cabling. Numerous other lesser-known Ethernet standards exist, including 10Base-FL, 10Base-FB, and 10Base-FP for fiber optic networks and 10Broad36 for broadband (cable television) cabling. All of the above traditional forms, including 10Base-T have been made obsolete by Fast and Gigabit Ethernet. By far the most popular of these is 100Base-T, a standard that includes 100Base-TX (Category 5 UTP), 100Base-T2 (Category 3 or better UTP), and 100Base-T4 (100Base-T2 cabling modified to include two additional wire pairs). While Fast Ethernet improved traditional Ethernet from 10 Megabit to 100 Megabit speed, Gigabit Ethernet boasts the same order-of-magnitude improvement over Fast Ethernet by offering speeds of 1000 Megabits (1 Gigabit). Gigabit Ethernet was first made to travel over optical and copper cabling, but the 1000Base-T standard successfully supports it as well. 1000Base-T uses Category 5 cabling similar to 100 Mbps Ethernet, although achieving gigabit speed requires the use of additional wire pairs. Traditional Ethernet employs a bus topology, meaning that all devices or hosts on the network use the same shared communication line. Each device possesses an Ethernet address, also known as MAC address. Sending devices use Ethernet addresses to specify the intended recipient of messages. Data sent over the Ethernet exists in the forms of frames. An Ethernet frame contains a header, a data section, and a footer having a combined length of no more than 1518 bytes. The Ethernet header contains the addresses of both the intended recipient and the sender. Data sent over the Ethernet is automatically broadcast to all devices on the network. By comparing their Ethernet address against the address in the frame header, each Ethernet device tests each frame to determine if it was intended for them and reads or discards the frame as appropriate. Network adapters incorporate this function into their hardware. Devices wanting to transmit on the Ethernet first perform a preliminary check to determine whether the medium is available or whether a transmission is currently in progress. If the Ethernet is available, the sending device transmits onto the wire. It's possible, however, that two devices will perform this test at approximately the same time and both transmit simultaneously. By design, as a performance trade-off, the Ethernet standard does not prevent multiple simultaneous transmission. These so-called collisions, when they occur, cause both transmissions to fail and require both sending devices to re-transmit. Ethernet uses an algorithm based on random delay times to determine the proper waiting period between re-transmissions. The network adapter also implements this algorithm. In traditional Ethernet, this protocol for broadcasting, listening, and detecting collisions is known as CSMA/CD (Carrier Sense Multiple Access / Collision Detection). Some newer forms of Ethernet do not use CSMA/CD. Instead, they use the so-called full duplex Ethernet protocol, which supports point-to-point simultaneous sends and receives with no listening required. As mentioned earlier, Ethernet cables are limited in their reach, and those distances (as short as 100 meters) are insufficient to cover medium-sized and large network installations. A repeater in Ethernet networking is a device that allows multiple cables to be joined and greater distances to be spanned. A bridge device can join an Ethernet to another network of a different type, such as a wireless network. One popular type of repeater device is an Ethernet hub. Other devices sometimes confused with hubs are switches and routers. Ethernet network adapters also exist in multiple forms. Newer personal computers and game consoles feature a built-in Ethernet adapter. USB-to-Ethernet adapters and wireless Ethernet adapters can also be configured to work with many newer devices. Ethernet is one of the Internet's key technologies. Despite its advanced age, Ethernet continues to power many of the world's local area networks and continually is improving to meet future needs for high-performance networking.